Do you like the outdoors like I do? My aunt lives in rural Southern Illinois and I love walking through the woods behind her house. No matter what time of year I visit, I discover something new. Since I didn't grow up in the country, I have a lot to learn about nature. I have learned how to find May Apples growing in spring and fall, but they are hidden by other weeds in the summer. I love taking photographs, so when I walk around outdoors, I always bring along my camera. The early shoots bring a little green color to the dry leaves from winter. When I walk in the woods in early spring, I look for May Apples. They grow in the same area each year and tend to spread. May Apples are also called hog apples, Indian apples, umbrella plants, wild mandrakes or devil's apples. 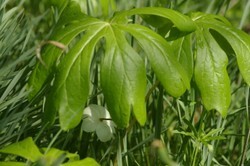 These plants grow in moist areas with dappled light shade. They grow quickly once they sprout out of the ground. They're actually an herb, and have long roots or underground stems (called rhizomes). I saw my first May Apple plant sprouting out of the ground on March 30 and then found several more as I walked further into the woods. The shoots are hard to spot unless you know what they look like and keep your eyes on the ground. They are the first green plants I find in the woods. The shoots don't stay small for long. I could see some change to the plants almost every day since they grow so quickly. For the next few days, I went back to the woods and saw more and more shoots coming up, and then watched them unfurl and open completely. The patches of opened May Apple plants made me imagine tiny elves living underneath the leaf canopies. The plants continue to grow until they are about 2 feet tall. Some of the plants will have one leaf and some will have two leaves. May Apples produce flowers in early May, but the fruit doesn't appear until later in the summer, ripening around August. May Apple plants can have one leaf or two leaves, but only the plants with two leaves will make a flower. The plant only makes one blossom, which blooms underneath the leaves. The flower isn't noticeable from above. The flowers are pollinated by bumblebees and other long-tongued bees. Every time I went out into the woods, I kept checking for flowers. Finally on the first day of May, I saw some blossoms. The blooms last about 3 weeks and then become a tiny oval fruit. In mid-summer, the blossom turns into a smooth green berry. I've read that they become the size of a small lemon, but I've only seen fruit the size of a crab apple. As the fruit ripens, the plant's leaves die off, so they may be hard to locate if you don't have your May Apple patch marked. The fruit is edible only if it's fully ripe (turns yellow and becomes soft). Ripe May Apple fruit can be eaten raw, cooked, or made into jams, jellies, and pies. Unripe fruit, leaves, seeds and rhizomes (roots) are slightly poisonous. To make sure the fruit is ripe, the skin should have no hint of green. The pulp should have a jellylike texture and the berry should be ready to fall to the ground or already on the ground. The fruit is also eaten by box turtles, squirrels, deer, and possibly by opossums, raccoons, and skunks. I have never been able to find a fully ripe May Apple fruit; they are always eaten by the wildlife before they turn yellow. Do You Like Looking for Wild Plants? I love mayapple! They're a fantastic and under-utilized landscaping plant too...I often hear people complain that they "can't grow anything in shade" and this is one of the many native wildflowers that thrives in shade...and the leaf is beautiful and interesting-looking too. I find it can co-exist well with other native wildflowers like jack-in-the-pulpit. I find the leaves stay green longer if the conditions are moist; they die back earlier in dry soils or if they are getting more light than they like. I've eaten a ripe one too...they have a peculiar and unique flavor, almost like a combination of the aroma of tropical fruit like passionfruit or guava, with a sort of bready aroma, like unbaked sourdough bread. Very pleasant though! Black walnuts have a distinct flavor that is different from the English walnuts found in most grocery stores. Black walnuts give cakes, ice cream, and cookies a great taste.